Stylish, Wall Display Rack Securely Stores Heavy Loads With A Sturdy Construction So You Can Keep All Your Essential Files Close. Design Includes An Integral Base Assembly And Five Transparent Adjustable Dividers For Two To Six Compartments. Crystal Dividers Include A Cutaway Front Section For Easy Access. Label Holder Allows Easy Organization And Quick Identification. Heavy-Duty Display Rack Is Made Of Recyclable, Shock-Resistant Polystyrene. 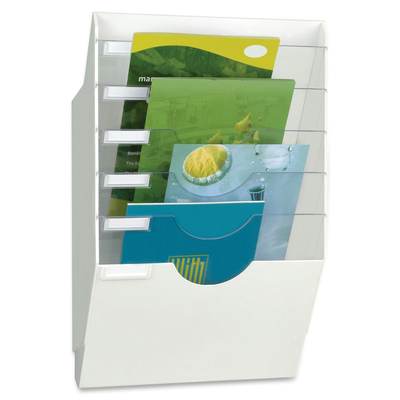 Wall File Accepts Large And Thick Documents Up To 9-4/9" X 12-3/5", And Items Can Be Stored Vertically Or Horizontally. Separate Units Can Be Assembled Into Vertical Clusters And Mounted Side-By-Side In Banks To Create A Bank Of Wall Files. Wall Fixing Kit Is Included.. Stylish, Wall Display Rack Securely Stores Heavy Loads With A Sturdy Construction So You Can Keep All Your Essential Files Close. Design Includes An Integral Base Assembly And Five Transparent Adjustable Dividers For Two To Six Compartments. Crystal Dividers Include A Cutaway Front Section For Easy Access. Label Holder Allows Easy Organization And Quick Identification. Heavy-Duty Display Rack Is Made Of Recyclable, Shock-Resistant Polystyrene. Wall File Accepts Large And Thick Documents Up To 9-4/9" X 12-3/5", And Items Can Be Stored Vertically Or Horizontally. Separate Units Can Be Assembled Into Vertical Clusters And Mounted Side-By-Side In Banks To Create A Bank Of Wall Files. Wall Fixing Kit Is Included.